Step by step tutorial of building simple chat application using MEAN stack (Angular 4) and Socket.io. This is another tutorial of Angular 4 as part of MEAN Stack. Right now, we will build simple real chat application using MEAN Stack (Angular 4) and Socket.io. And this is our chat app will look like. If you not sure where to start, please refer this tutorial. Don't worry, we always start tutorial from scratch, so you won't miss anything. Prepare this tools before we start. After you have successfully install Node.js, now install or upgrade Angular CLI. The last version of angular CLI automatically add Angular 4 dependencies instead of Angular 2. Open terminal or Node command line then type this command. Next, go to your Node project folder then create new Angular 4 application by type this command. Open the package.json file in the root of this Angular project. You will see a difference between this project and previous Angular CLI project. Now, all Angular dependencies that generated from Angular CLI already Angular 4. Go to the newly created Angular 4 project in the terminal. 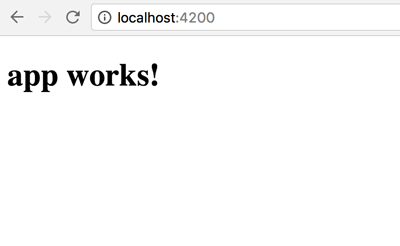 Open your browser then point to this address "http://localhost:4200" and you will see this page in your browser. Stop the server by push keyboard Ctrl+C. Type this command to install Express.js and required dependencies. Create a folder with the name "bin" and add a file with the name "www" on the root of the project. Fill "www" file with this codes. Now, open and edit "package.json" then replace "start" value. Next, create "app.js" in the root of the project folder. Open and edit app.js then add this lines of codes. Create routes for the chat. Open and edit "chat.js" then add this lines. 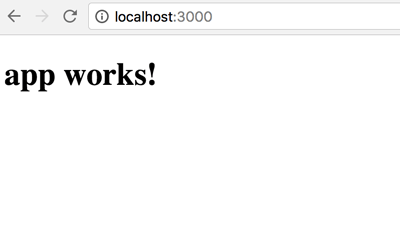 Now, start Express.js server by typing this command. Open the browser then point to this address "http://localhost:3000". You will see this page. Then change the address to "http://localhost:3000/chat". It will show this page. We will access chat data using REST API. Before go further, install Mongoose.js first as an ODM/ORM of MongoDB. After stopping the server, type this command for it. Add this require to app.js. Add this lines after require to make a connection to MongoDB. Now, we will install Socket.io and Socket.io client library. Type this command to achieve it. Next, we will create single collections for hold chat data. For that, create a model folder and file for building Mongoose Model Schema. Open and edit "models/Chat.js" then add this lines of codes. Open and edit again "routes/chat.js" then replace all codes with this. In that code, we are running Socket.io to listen for 'save-message' that emitted from the client and emit 'new-message' to the clients. Now, re-run our MEAN application. Open another terminal then type this command to test REST API. 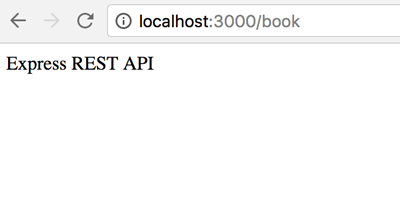 For serving asynchronous access to REST API, we will create service or provider. Just type this simple command to create it. Open and edit "src/app/app.module.ts" then add this import for chat service. Also add ChatService to @NgModule providers. Open and edit "src/app/chat.service.ts" then replace all codes with this. Because our application using single page. We only need to create one Angular 4 component. Type this command to achieve that. Open and edit "src/app/chat/chat.component.ts" then add this lines of codes. That codes describe all functionality of this simple chat application. Now, we will build a view for the chat room. Before edit chat component, open and edit "src/index.html" then replace all codes so it will look like this. We are about add bootstrap for styling the chat room. Next, open and edit "src/app/chat/chat.component.html" then replace all codes with this codes. Give that view a litle style by edit "src/app/chat/chat.component.css" then replace all codes with this. Finally, build and run this application by type this commands. Now, you can try chatting in multiple different browsers in your PC/Laptop or different PC/Laptop by pointing to this address "localhost:3000" or "your-ip-address:3000". Warning: This tutorial is experiments of Angular 4 with MEAN Stack. We suggest don't try this tutorial in production. That it's for now, please give us suggestion or critics to improve this tutorial. If you feel there's is something wrong with this tutorial that you follow, don't worry we have put the complete source code on our Github.